In America, today is one of our greatest holidays: Black Friday. It's the day where we stand in line outside stores at dawn and race inside to snap up deals. Or, for those of us who hate crowds and lines, we leisurely check out the sales online, decide it's not worth it, and watch the annual Day After Thanksgiving Nebraska football game. But in the spirit of all those shoppers out there, who I may join later in the day (I need a new coffee pot and laptop), today's Reading in the Kitchen is for you. In honor of Black Friday, I decided to make a dish from one of the best shopping-related books out there: Sophie Kinsella's Confessions of a Shopaholic. If you'll remember (or if you're learning this for the first time, because you've never read the book), in one of her attempts to cut-back her spending, Becky Bloomwood decides to try her hand at making homemade curry. It turns out badly. She spends more money on the supplies than it would have cost to order it, and she makes it too spicy to be edible. It goes so poorly, her best friend/ roommate Suze suggests Becky find a way to increase her income instead. This leads down another misadventurous path, but that's not the point. Curry is the point. I'm making curry in honor of Black Friday. And because today is the first Friday I haven't had to work since starting this series, I thought I'd try something different: live blogging. Via Twitter, I will prep and cook a vegetarian curry dish. I'll include photos and short comments about each step of the process. • Prep work will begin at 10:15 a.m. Central. • I'll hope to cook the dish by 10:45 a.m.
• I'll share my impressions of the dish, along with whoever I have eating it with me during the football game. • I'll post my recap at 2 p.m. If you have Twitter, follow me @lmchap. 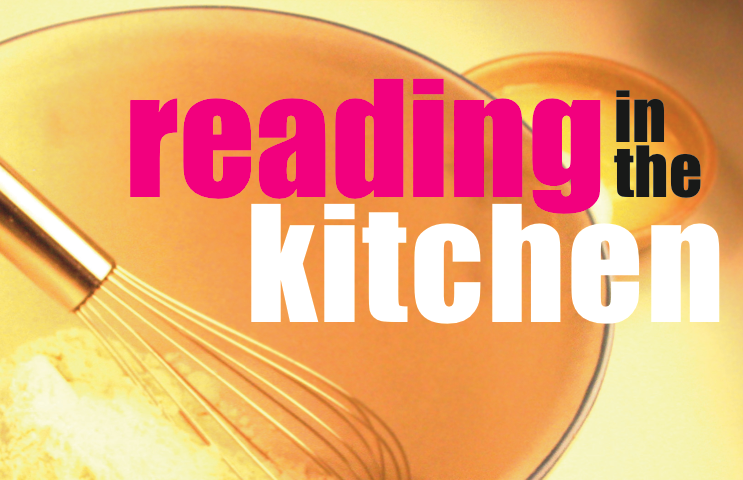 I'll include #ReadingintheKitchen to each related post for those of you who don't want to read my thoughts about the Nebraska game. (Those posts will be marked #GBR, of course). Please feel free to Tweet me your thoughts and comments along the way using the hashtag. I may Retweet or include some of my favorites in the recap. If you do not have Twitter, you can check back on this blog. I will temporarily move the Twitter view from the sidebar to the main section for easier viewing. Later, I will post the recap, which will have everything all in one place. This will be fun. I'm totally pumped and excited for this challenge. I hope you'll join me — and that my cooking experience goes better than Becky's.